Story: Story was one of the kids running around the streets trying to survive. One day the man only known as the Old Man took Story and two other kids, Rags and Johnny, to the Graveyard of Forgotten Heroes. At the graveyard the three kids robbed some of the graves taking some of the superhero's equipment. Among the graves Story found a pair of boots with extendable soles . For weeks the Old Man trained Story and his two friends in using their equipment at the cemetery. The kids were instructed to wear masks, as what they were doing was not for personal glory. Finally one day Johnny had enough of the training and the three kids went back into the town where they fought the B.T.L. successfully . 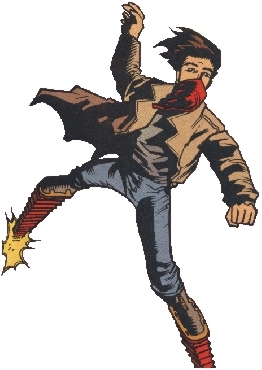 Equipment: Story wears a pair of boots with extendable soles. The boots can be used for both reaching high places and kicking objects or adversaries that would normally be out of reach.